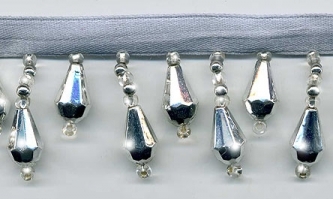 From our Beaded Drop Collection: If you are looking for a shiny metallic silver beaded fringe trim, this is a beautiful choice. The longer beaded stands are 1" long, not including the platinum silver satin ribbon. Pure shine! Perfect for crafts & projects. Pure shine!